Britain's Imperial War Museum commissioned Jackson, the mastermind behind the epic film versions of The Lord of the Rings and The Hobbit, to make a film commemorating the 100th anniversary of Armistice Day, which marks the end of World War I. As Jackson commented during a pre-screening introductory clip, he wasn't sure where to go with the enormous vault of film and audio footage — a treasure trove of material with which to craft a new movie experience. Given a 2-minute sample of footage, Jackson and his wizards made Kiwi magic, going through a restoration process that sharpened the picture quality and smoothed the motion. Watching that touched-up clip, underlying sensations long-lost to the ages came back to the fore. Body language returned. Dusted off facial expressions revitalized the humanity. From there, Jackson went on to create a documentary unlike any other about World War I. It is a truly theatrical experience as the coverage begins in the old 1.33:1 aspect ratio. Simple black-and-white footage of pre-war domestic life segues into training camp. 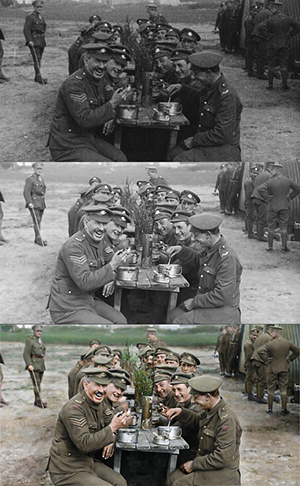 Then, when the British soldiers cross the Channel and enter war-torn Belgium, the image smoothly shifts into the modern 1.85:1 aspect ratio. The images are in color. And in 3-D. The 3D isn't a gimmick. It adds a sense of depth and brings the human beings in those old, old film clips back to life in unexpected ways. At times, there's information overload. Jackson eschews the standard approach of a singular voice guiding audiences through the documentary's narrative; as Jackson describes it, this is a documentary made by a non-historian for non-historians. Instead, Jackson and his team waded through 600 hours of interviews with WWI veterans (specifically those conducted during the 1960s and 1970s — a selection made at Jackson's request in order to retrieve stories told while the vets were still relatively young). So, the presentation then becomes two-fold — absorbing the new-found visual intensity of the restored (and otherwise long-shelved) footage alongside the aural experience of hearing the veterans relate stories of war life. And those stories are oftentimes insane. Grueling, filthy, unsanitary conditions. No mere words can do justice to the reality. And that's where the footage fills the gaps. This documentary has been rated "R" because of the grisly brutality captured on film that's survived an entire century. There are stories of boys as young as 15 and 16 claiming to be 18, making them of legal age and eligible to join the movement. Gung-ho? Yes. The troopers gained 1 stone (14 pounds) in weight and 1 inch in height during training camp. By the end of camp, they were boys turned into men; they were afraid of nobody — not even the sergeant-major, as one man relates. One soldier reveals he had one uniform issued and he wore it for the entire 4 years of his war service. Another talks about the "delight" of hearing the first shell. Yet another describes the experience as akin to "camping with a light spice of danger." Some of the comments are painfully understated. "There was a job to be done." "If you survive this, you'll survive anything." "You learned to look after yourself." Those voices speak of human character, courage and pluck — traits that are fading away over time. This daring selfless generation has given way to the vapid selfie generation. Two vastly different generations. Two vastly different interpretations of the phrase, "Chin up." "Those who don't know history are doomed to repeat it." It's a quote attributed to Edmund Burke, who lived in the 18th century. And, fitfully, it was repeated by George Santayana a century later. Let They Shall Not Grow Old serve as another reminder of the cost of war. The toll in terms of blood and treasure is really impossible to calculate. As the enemy lines blurred, German soldiers were relieved to be captured by British troops. Back then, the language barrier between German and English was itself a struggle. But the soldiers still managed to communicate and they respected each other. They actually bonded. They sympathized. And they all doubted the war was worth the effort. All of those twists and turns are captured here — alongside the disgusting visuals of gangrene-rattled bodies are humorous anecdotes about beer, cigarettes and brothels. In regard to the latter, the trenches were safer. Consider this turn of events. Britain is victorious. The soldiers return home. They're actively denied job opportunities by those who refuse to consider employing vets. It puts in fresh perspective events in America after the Vietnam debacle. And it offers new consideration for what service men and women endure today. A military force is a necessity now more than ever. It's not a world of rainbows and unicorns. The world is a dangerous place. And people need to return to a maturity that appreciates the sacrifice — both while it's being made and after. The sacrifices of those British troopers during the madness of 1914-1918 has made possible all that's good in the world today.